If you have additions, corrections or would like a biography included in a record please use the or "Update Info" link after you locate the person in the database. If the person is not listed use the ADD NEW RECORD button. We strongly believe in citing sources, therefore your name and e-mail address must be included before any changes can be made to records because YOU are the source. Including your mailing address and/or phone number will insure that if your e-mail address becomes unavailable, the database manager can contact you. That information will NOT be included in the online records. Please do not email a query about one person. What you see is all that we have. Please be patient as additions to the database are not automatic and may take several days before they are added. This database would not exist without the tremendous time and effort of Lawrence and Sue Dale. 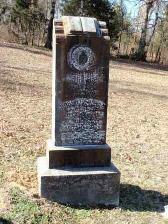 Carol Hammack took many of the headstone photographs. You are visitor 10785 to this page.